Massively multiplayer online role-playing games (MMORPGs) are a combination of role-playing video games and massively multiplayer online games in which a very large number of players interact with one another within a virtual world. As in all RPGs, the player assumes the role of a character (often in a fantasy world or science-fiction world) and takes control over many of that character's actions. MMORPGs are distinguished from single-player or small multi-player online RPGs by the number of players able to interact together, and by the game's persistent world (usually hosted by the game's publisher), which continues to exist and evolve while the player is offline and away from the game. MMORPGs are played throughout the world. Worldwide revenues for MMORPGs exceeded half a billion dollars in 2005, and Western revenues exceeded a billion dollars in 2006. In 2008, the spending on subscription MMORPGs by consumers in North America and Europe grew to $1.4 billion. World of Warcraft, a popular MMORPG, has over 10 million subscribers as of November 2014. World of Warcraft's total revenue was $1.04 billion US dollars in 2014. Star Wars: The Old Republic, released in 2011, became the world's 'Fastest-Growing MMOG Ever' after gaining more than 1 million subscribers within the first three days of its launch. Although modern MMORPGs sometimes differ dramatically from their predecessors, many of them share the same basic characteristics. These include several common features: persistent game environment, some form of level progression, social interaction within the game, in-game culture, system architecture, membership in a group, and character customization. The majority of popular MMORPGs are based on traditional fantasy themes, often occurring in an in-game universe comparable to that of Dungeons & Dragons. Some employ hybrid themes that either merge or replace fantasy elements with those of science fiction, sword and sorcery, or crime fiction. Still, others draw thematic material from American comic books, the occult, and other genres. Often, these elements are developed using similar tasks and scenarios involving quests, monsters, and loot. In nearly all MMORPGs, the development of the player's character is the primary goal. Nearly all MMORPGs feature a character progression system, in which players earn experience points for their actions and use those points to reach character "levels", which makes them better at whatever they do. Traditionally, combat with monsters and completing quests for non-player characters, either alone or in groups, are the primary ways to earn experience points. The accumulation of wealth (including combat-useful items) is also a way to progress in many MMORPGs. This is traditionally best accomplished via combat. The cycle produced by these conditions, combat leading to new items allowing for more combat with no change in gameplay, is sometimes pejoratively referred to as the level treadmill, or "grinding". The role-playing game Progress Quest was created as a parody of this trend. Eve Online trains skills in real time rather than using experience points as a measure of progression. In some MMORPGs, there is no limit to a player's level, allowing the grinding experience to continue indefinitely. MMORPGs that use this model often glorify top ranked players by displaying their avatars on the game's website or posting their stats on a high score screen. Another common practice is to enforce a maximum reachable level for all players, often referred to as a level cap. Once reached, the definition of a player's progression changes. Instead of being awarded primarily with experience for completing quests and dungeons, the player's motivation to continue playing will be replaced with collecting money and equipment. Often, the widened range of equipment available at the maximum level will have increased aesthetic value to distinguish high ranking players in game between lower ranked players. Colloquially known as endgame gear, this set of empowered weapons and armor adds a competitive edge to both scripted boss encounters as well as player vs player combat. Player motivation to outperform others is fueled by acquiring such items and is a significant determining factor in their success or failure in combat-related situations. MMORPGs almost always have tools to facilitate communication between players. Many MMORPGs offer support for in-game guilds or clans, though these will usually form whether the game supports them or not. In addition, most MMOGs require some degree of teamwork in parts of the game. These tasks usually require players to take on roles in the group, such as protecting other players from damage (called tanking), "healing" damage done to other players or damaging enemies. MMORPGs generally have Game Moderators or Game Masters (frequently referred to as GMs or "mods"), who may be paid employees or unpaid volunteers who attempt to supervise the world. Some GMs may have additional access to features and information related to the game that are not available to other players and roles. Relationships formed in MMORPGs can often be just as intense as relationships formed between friends or partners met outside the game, and often involve elements of collaboration and trust between players. Most MMORPGs provide different types of classes that players can choose. Among those classes, a small portion of players choose to roleplay their characters, and there are rules that provide functionality and content to those who do. Community resources such as forums and guides exist in support of this play style. For example, if a player wants to play a priest role in his MMORPG world, he might buy a cope from a shop and learn priestly skills, proceeding to speak, act, and interact with others as their character would. This may or may not include pursuing other goals such as wealth or experience. Guilds or similar groups with a focus on roleplaying may develop extended in-depth narratives using the setting and resources similar to those in the game world. Over time, the MMORPG community has developed a sub-culture with its own slang and metaphor, as well as an unwritten list of social rules and taboos. Players will often complain about 'grind' (a slang term for any repetitive, time-consuming activity in an MMORPG), or talk about 'buffs' and 'nerfs' (respectively an upgrade or downgrade of a particular game mechanic). As with all such cultures, social rules exist for such things as invitations to join an adventuring party, the proper division of treasure, and how a player is expected to behave while grouped with other players. Debate rages in various gaming media over the long-term effect of video game overuse. The On-Line Gamers Anonymous forums are filled with stories of players that have neglected social, employment and/or family responsibilities in favor of their virtual lives. Most MMORPGs are deployed using a client–server system architecture. The server software generates a persistent instance of the virtual world that runs continuously, and players connect to it via a client software. The client software may provide access to the entire playing world, or further 'expansions' may be required to be purchased to allow access to certain areas of the game. EverQuest and Guild Wars are two examples of games that use such a format. Players generally must purchase the client software for a one-time fee, although an increasing trend is for MMORPGs to work using pre-existing "thin" clients, such as a web browser. Some MMORPGs require payment or a monthly subscription to play. By definition, "massively multiplayer" games are always online, and most require some sort of continuous revenue (such as monthly subscriptions and advertisements) for maintenance and development purposes. Some games, such as Guild Wars have disposed of the 'monthly fee' model entirely, and recover costs directly through sales of the software and associated expansion packs. Still, others adopt a micropayment model where the core content is free, but players are given the option to purchase additional content, such as equipment, aesthetic items, or pets. Games that make use of this model often have originated in Korea, such as Flyff and MapleStory. This business model is alternately called "pay for perks" or "freemium", and games using it often describe themselves with the term "free-to-play". Depending on the number of players and the system architecture, an MMORPG might actually be run on multiple separate servers, each representing an independent world, where players from one server cannot interact with those from another; World of Warcraft is a prominent example, with each separate server housing several thousand players. 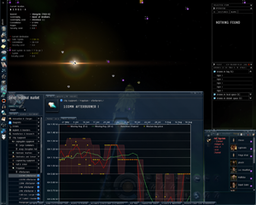 In many MMORPGs the number of players in one world is often limited to around a few thousand, but a notable example of the opposite is EVE Online, which accommodates several hundred thousand players on the same server, with over 60,000 playing simultaneously (June 2010) at certain times. Some games allow characters to appear on any world, but not simultaneously (such as Seal Online: Evolution), others limit each character to the world in which it was created. World of Warcraft has experimented with "cross-realm" (i.e. cross-server) interaction in player vs player "battlegrounds", using server clusters or "battlegroups" to co-ordinate players looking to participate in structured player vs player content such as the Warsong Gulch or Alterac Valley battlegrounds. Additionally, patch 3.3, released on December 8, 2009, introduced a cross-realm "looking for group" system to help players form groups for instanced content (though not for open-world questing) from a larger pool of characters than their home server can necessarily provide. MMORPG is a term coined by Richard Garriott to refer to massive multiplayer online role-playing games and their social communities. The link between Garriott and the MMORPG term has been recognised by many scholars. Previous to this and related coinages, these games were generally called graphical MUDs; the history of MMORPGs traces back directly through the MUD genre. Through this connection, MMORPGs can be seen to have roots in the earliest multi-user games such as Mazewar (1974) and MUD1 (1978). 1985 saw the release of a roguelike (pseudo-graphical) MUD called Island of Kesmai on CompuServe and Lucasfilm's graphical MUD Habitat. The first fully graphical multi-user RPG was Neverwinter Nights, which was delivered through America Online in 1991 and was personally championed by AOL President Steve Case. Other early proprietary graphical online RPGs include three on The Sierra Network: The Shadow of Yserbius in 1992, The Fates of Twinion in 1993, and The Ruins of Cawdor in 1995. Another milestone came in 1995 as NSFNET restrictions were lifted, opening the Internet up for game developers, which allowed for the first truly "massively"-scoped titles. Finally, MMORPGs as defined today began with Meridian 59 in 1996, innovative both in its scope and in offering first-person 3D graphics, with The Realm Online appearing nearly simultaneously. Ultima Online, released in 1997, is often credited with first popularizing the genre, though more mainstream attention was garnered by 1999's EverQuest and Asheron's Call in the West and 1996's Nexus: The Kingdom of the Winds in South Korea. The financial success of these early titles has ensured competition in the genre since that time. MMORPG titles now exist on consoles and in new settings. As of 2008, the market for MMORPGs has Blizzard Entertainment's World of Warcraft dominating as the largest MMORPG, alongside other titles such as Final Fantasy XIV and Guild Wars 2, though an additional market exists for free-to-play MMORPGs, which are supported by advertising and purchases of in-game items. This free-to-play model is particularly common in South Korea such as MapleStory, Rohan: Blood Feud, and Atlantica Online. Also, there are some free-to-play games, such as RuneScape and Tibia, where the game is free, but one would have to pay monthly to play the game with more features. Guild Wars and its sequel avoid some degree of competition with other MMORPGs by only requiring the initial purchase of the game to play. The cost of developing a competitive commercial MMORPG title often exceeded $10 million in 2003. These projects require multiple disciplines within game design and development such as 3D modeling, 2D art, animation, user interfaces, client/server engineering, database architecture, and network infrastructure. The front-end (or client) component of a commercial, modern MMORPG features 3D graphics. As with other modern 3D games, the front-end requires expertise with implementing 3D engines, real-time shader techniques and physics simulation. The actual visual content (areas, creatures, characters, weapons, spaceships and so forth) is developed by artists who typically begin with two-dimensional concept art, and later convert these concepts into animated 3D scenes, models and texture maps. Developing an MMOG server requires expertise with client/server architecture, network protocols, security, and database design. MMORPGs include reliable systems for a number of vital tasks. The server must be able to handle and verify a large number of connections, prevent cheating, and apply changes (bug fixes or added content) to the game. A system for recording the games data at regular intervals, without stopping the game, is also important. Maintenance requires sufficient servers and bandwidth, and a dedicated support staff. Insufficient resources for maintenance lead to lag and frustration for the players, and can severely damage the reputation of a game, especially at launch. Care must also be taken to ensure that player population remains at an acceptable level by adding or removing servers. Peer-to-peer MMORPGs could theoretically work cheaply and efficiently in regulating server load, but practical issues such as asymmetrical network bandwidth, CPU-hungry rendering engines, unreliability of individual nodes, and inherent lack of security (opening fertile new grounds for cheating) can make them a difficult proposition. The hosted infrastructure for a commercial-grade MMORPG requires the deployment of hundreds (or even thousands) of servers. Developing an affordable infrastructure for an online game requires developers to scale large numbers of players with less hardware and network investment. In addition, the development team will need to have expertise with the fundamentals of game design: world-building, lore and game mechanics, as well as what makes games fun. Screenshot of an event in the MMORPG Ryzom, an open source and free content game (2014). Though the vast majority of MMORPGs are produced by companies, many small teams of programmers and artists have contributed to the genre. As shown above, the average MMORPG development project requires enormous investments of time and money, and running the game can be a long-term commitment. As a result, non-corporate (or independent, or "indie") development of MMORPGs is less common compared to other genres. Still, many independent MMORPGs do exist, representing a wide spectrum of genres, gameplay types, and revenue systems. Some independent MMORPG projects are completely open source, while others feature proprietary content made with an open-source game engine. The WorldForge project has been active since 1998 and formed a community of independent developers who are working on creating framework for a number of open-source MMORPGs. The Multiverse Foundation has also created a platform specifically for independent MMOG developers. As there are a number of wildly different titles within the genre, and since the genre develops so rapidly, it is difficult to definitively state that the genre is heading in one direction or another. Still, there are a few obvious developments. One of these developments is the raid group quest, or "raid", which is an adventure designed for large groups of players (often twenty or more). Instance dungeons, sometimes shortened to "instances", are game areas that are "copied" for individual players or groups, which keeps those in the instance separated from the rest of the game world. This reduces competition, and also reducing the amount of data that needs to be sent to and from the server, reducing lag. The Realm Online was the first MMORPG to begin to use a rudimentary form of this technique and Anarchy Online would develop it further, using instances as a key element of gameplay. Since then, instancing has become increasingly common. The "raids", as mentioned above, often involve instance dungeons. Examples of games which feature instances are World of Warcraft, The Lord of the Rings Online, EverQuest, EverQuest II, Aion, Final Fantasy XIV, Guild Wars, Rift, RuneScape, Star Trek Online and DC Universe Online. Increased amounts of "player-created content" is another trend. The use of intellectual property licensing common in other video game genres has also appeared in MMORPGs. 2007 saw the release of The Lord of the Rings Online, based on J. R. R. Tolkien's Middle-earth. Other licensed MMORPGs include The Matrix Online, based on the Matrix trilogy of films, Warhammer Online: Age of Reckoning, based on Games Workshop's table top game, Star Wars Galaxies, Star Wars The Old Republic, Champions Online and Age of Conan. Additionally, several licenses from television have been optioned for MMORPGs, for example Star Trek Online and Stargate Worlds (which was later canceled). The first console-based MMORPG was Phantasy Star Online for the Sega DreamCast. The first console-based open-world MMORPG was Final Fantasy XI for the PlayStation 2. EverQuest Online Adventures, also on the PlayStation 2, was the first console MMORPG in North America. Although console-based MMORPGs are considered more difficult to produce, the platform is gaining more attention. With the popularization of Facebook and microtransactions has come a new wave of Flash and HTML5 based MMORPGs that use the free to play model. They require no download outside of a browser and usually have heavily integrated social media sharing features. An example of a browser-based MMORPG is Freewar. Smartphones with their GPS capabilities (amongst others) enable augmented reality games such as Ingress and Pokémon Go. The games are enhanced by location and distance based tracking, bench marking goals or facilitating trade between players. Since the interactions between MMORPG players are real, even if the environments are virtual, psychologists and sociologists are able to use MMORPGs as tools for academic research. Sherry Turkle has found that many people have expanded their emotional range by exploring the many different roles (including gender identities) that MMORPGs allow a person to explore. Nick Yee has surveyed more than 35,000 MMORPG players over the past several years, focusing on psychological and sociological aspects of these games. Recent findings included that 15% of players become a guild-leader at one time or another, but most generally find the job tough and thankless; and that players spend a considerable amount of time (often a third of their total time investment) doing things that are external to gameplay but part of the metagame. Many players report that the emotions they feel while playing an MMORPG are very strong, to the extent that 8.7% of male and 23.2% of female players in a statistical study have had an online wedding. Other researchers have found that the enjoyment of a game is directly related to the social organization of a game, ranging from brief encounters between players to highly organized play in structured groups. In a study by Zaheer Hussain and Mark D. Griffiths, it was found that just over one in five gamers (21%) said they preferred socializing online to offline. Significantly more male gamers than female gamers said that they found it easier to converse online than offline. It was also found that 57% of gamers had created a character of the opposite gender, and it is suggested that the online female persona has a number of positive social attributes. A German fMRT-study conducted by researchers of the Central Institute of Mental Health points towards impairments in social, emotional and physical aspects of the self-concept and a higher degree in avatar identification in addicted MMORPG players, compared to non-addicted and naive (nonexperienced) people. These findings generally support Davis' cognitive behavioral model of Internet addiction, which postulates that dysfunctional self-related cognitions represent central factors contributing towards the development and maintenance of MMORPG addiction. The high degree of avatar identification found by Leménager et al. in the addicted group of this study indicates that MMORPG playing may represent an attempt to compensate for impairments in self-concept. Psychotherapeutic interventions should therefore focus on the development of coping strategies for real-life situations in which addicted players tend to experience themselves as incompetent and inferior. Richard Bartle, author of Designing Virtual Worlds, classified multiplayer RPG-players into four primary psychological groups. His classifications were then expanded upon by Erwin Andreasen, who developed the concept into the thirty-question Bartle Test that helps players determine which category they are associated with. With over 650,000 test responses as of 2011, this is perhaps the largest ongoing survey of multiplayer game players. Based on Bartle and Yee's research, Jon Radoff has published an updated model of player motivation that focuses on immersion, competition, cooperation and achievement. These elements may be found not only in MMORPGs, but many other types of games and within the emerging field of gamification. In World of Warcraft, a temporary design glitch attracted the attention of psychologists and epidemiologists across North America, when the "Corrupted Blood" disease of a monster began to spread unintentionally—and uncontrollably—into the wider game world. The Centers for Disease Control used the incident as a research model to chart both the progression of a disease, and the potential human response to large-scale epidemic infection. Many MMORPGs feature living economies. Virtual items and currency have to be gained through play and have definite value for players. Such a virtual economy can be analyzed (using data logged by the game) and has value in economic research. More significantly, these "virtual" economies can affect the economies of the real world. The ability for players to sell an item to each other for in-game (virtual) currency. Bartering for items between players for items of similar value. The purchase of in-game items for real-world currency. Exchanges of real-world currencies for virtual currencies. The invention of user-created meta-currencies such as Dragon kill points to distribute in-game rewards. The idea of attaching real-world value to "virtual" items has had a profound effect on players and the game industry, and even the courts. The virtual currency selling pioneer IGE received a lawsuit from a World of Warcraft player for interfering in the economics and intended use of the game by selling WoW gold. Castronova's first study in 2002 found that a highly liquid (if illegal) currency market existed, with the value of Everquest's in-game currency exceeding that of the Japanese yen. Some people even make a living by working these virtual economies; these people are often referred to as gold farmers, and may be employed in game sweatshops. Game publishers usually prohibit the exchange of real-world money for virtual goods, but others actively promote the idea of linking (and directly profiting from) an exchange. In Second Life and Entropia Universe, the virtual economy and the real-world economy are directly linked. This means that real money can be deposited for game money and vice versa. Real-world items have also been sold for game money in Entropia, and some players of Second Life have generated revenues in excess of $100,000. Bots spamming a communication channel in RuneScape to advertise illegitimate market websites. The use of "bots" or automated programs, that assist some players in accumulating in-game wealth to the disadvantage of other players. The use of unsanctioned auction sites, which has led publishers to seek legal remedies to prevent their use based on intellectual-property claims. The emergence of virtual crime, which can take the form of both fraud against the player or publisher of an online game, and even real-life acts of violence stemming from in-game transactions. Linking real-world and virtual economies is rare in MMORPGs, as it is generally believed to be detrimental to gameplay. If real-world wealth can be used to obtain greater, more immediate rewards than skillful gameplay, the incentive for strategic roleplay and real game involvement is diminished. It could also easily lead to a skewed hierarchy where richer players gain better items, allowing them to take on stronger opponents and level up more quickly than less wealthy but more committed players. ^ Parks Associates (2005). "Online Gaming Revenues to Triple by 2009". Retrieved 2007-05-02. ^ Harding-Rolls, Piers (2006). Western World MMOG Market: 2006 Review and Forecasts to 2011 (PDF). London, UK: Screen Digest. Archived from the original (PDF) on 2007-06-04. Retrieved 2007-05-17. ^ Harding-Rolls, Piers (2009). Subscription MMOGs: Life Beyond World of Warcraft (PDF). London, UK: Screen Digest. Archived from the original (PDF) on 2009-12-25. Retrieved 2009-03-30. ^ Reilly, Luke (2014-11-19). "World of Warcraft Subscriptions Back Over 10 Million". IGN. Retrieved 2015-02-09. ^ Tassi, Paul. "'World of Warcraft' Still A $1B Powerhouse". Forbes.com. Forbes. Retrieved 6 March 2015. ^ "Star Wars: The Old Republic Jumps to Light Speed (NASDAQ:EA)". Investor.ea.com. 2011-12-23. Retrieved 2012-04-11. ^ Rundle, Michael (2011-12-27). "Star Wars: The Old Republic Is 'Fastest-Growing MMO Ever' With 1m Users". Huffington Post. ^ Mulligan, Jessica; Patrovsky, Bridgette (2003). Developing Online Games: An Insider's Guide. New Riders. pp. 474, 477. ISBN 1-59273-000-0. [pp. 474] experience points A point value that is accumulated by gameplay activity such as leveling and is used as a measure of a character's power. Popularized by the classic dice version of TSR's Advanced Dungeons & Dragons back in the 1970s and carried over to online gaming by designers. [pp. 477] level A rank or rating of a character's power. [...] leveling Activity in-game devoted to increasing a character's experience, level, and/or skills. Leveling usually consists of killing mobs. ^ Nicholas, Munn J. "The Reality of Friendship Within Immersive Virtual Worlds." Springer Science+Business Media (2011): 1-10. Web. 24 Oct. 2013. ^ R.Schroeder & A. Axelsson (2006). "The Psychology of MMORPGs: Emotional Investment, Motivations, Relationship Formation, and Problematic Usage". Avatars at Work and Play: Collaboration and Interaction in Shared Virtual Environments (PDF). Nicholas Yee. London: Springer-Verlag. pp. 187–207. ISBN 1-4020-3883-6. ^ "This Weekend: The Alliance Tournament Finals!". ^ Safko, Lon; Brake, David (2009). The Social Media Bible: Tactics, Tools, and Strategies for Business Success. Wiley. ISBN 0-470-41155-4. Richard Garriott first coined the term MMORPG in 1997. ^ Bainbridge, William Sims (2004). Berkshire Encyclopedia of Human-Computer Interaction. 2. Berkshire Publishing Group. p. 474. ISBN 0-9743091-2-5. Developers had long considered writing a graphical MUD. [...] the last major 2D virtual environment in the West marked the true beginning of the fifth age of MUDs: Origin Systems' 1997 Ultima Online (UO). ^ "Bringing Habitat Back to Life". pastemagazine.com. Retrieved 2016-02-22. ^ a b c d Koster, Raph (2002-02-20). "Online World Timeline". Raph Koster's Website. Retrieved 2010-04-24. ^ Snow, Blake (2008-01-23). "World of Warcraft addicts 10 million subscribers". GamePro.com. Archived from the original on 2008-01-28. Retrieved 2008-06-15. ^ Koster, Raph (2005). A Theory of Fun for Game Design. Paraglyph Press. ISBN 1-932111-97-2. ^ "Ryzom is free software! What can we do from here?". Fsf.org. 2010-05-04. Retrieved 2015-07-21. ^ "About Multiverse". Multiverse. Retrieved 12 April 2014. ^ Wilson, Steve (December 14, 2006). "Casual Play: Raiding Needs to Die". Retrieved 2007-05-02. ^ "Console MMOs: a brief history of one man's couch-laden adventures". Retrieved 2016-09-22. ^ "Analysis: Why Aren't There More Console MMOs?". ^ Turkle, Sherry (1997-09-04). Life on the Screen: Identity in the Age of the Internet. Simon & Schuster. ISBN 0-684-83348-4. ^ Yee, Nick (2006-03-20). "Life as a Guild Leader". The Daedalus Project. Retrieved 2007-05-16. ^ Yee, Nick (2006-08-29). "Time Spent in the Meta-Game". The Daedalus Project. Retrieved 2007-05-16. ^ Yee, Nick (2006-08-29). "An Ethnography of MMORPG Weddings". The Daedalus Project. Retrieved 2007-05-16. ^ a b Leménager, Tagrid; Gwodz, Alexander; Richter, Anne; Reinhard, Iris; Kämmerer, Nina; Sell, Madlen; Mann, Karl (2013): "Self-Concept Deficits in Massively Multiplayer Online Role-Playing Games Addiction". European Addiction Research 19: 227-234. ^ Davis, RA (2001): A cognitive-behavioral model of pathological internet use. Computers in Human Behavior 17: 187-195. ^ "Bartle Test of Gamer Psychology". Retrieved 2011-01-30. ^ Radoff, Jon (April 2011). Game On: Energize Your Business with Social Games. ISBN 978-0-470-93626-9. ^ "Looking Back... World of Warcraft". CVG. 2005-01-04. Retrieved 2006-08-05. ^ a b Privantu, Radu (2007-02-17). "Tips on Developing an MMO Economy, Part I". DevMaster.net. Archived from the original on 2007-04-09. Retrieved 2007-04-21. ^ Castronova, Edward (2006). Synthetic Worlds: The Business and Culture of Online Games. University Of Chicago Press. pp. 10, 291. ISBN 0-226-09626-2. ^ Castronova, Edward; Fairfield, Joshua (2007). Dragon Kill Points: a Summary White Paper. Social Science Research Network. SSRN 958945. ^ "Virtual worlds wind up in real courts - Technology & science - Games". MSNBC. Retrieved 7 February 2005. ^ "IGE Sued by World of Warcraft Player". EscapistMagazine. 2007-06-01. ^ Whiting, Jason (2002-11-06). "Online Game Economies Get Real". Wired News. Retrieved 2007-05-16. ^ Lee, James (2005-07-05). "Wage Slaves". 1UP.com. Archived from the original on 2009-10-01. Retrieved 2007-04-21. ^ Hof, Robert (2006-05-01). "My Virtual Life". BusinessWeek. Retrieved 2007-05-16. ^ "Gamble your life away in ZT Online". Jøn, A. Asbjørn (2010). "The Development of MMORPG Culture and The Guild". Australian Folklore: A Yearly Journal of Folklore Studies. 25: 97–112. Dyer-Witheford, Nick; de Peuter, Greig (2009). Games of empire: Global capitalism and video games. University of Minnesota Press. Jenkins, Henry (2004). Game Design as Narrative Architecture. First Person: New Media as Story, Performance, and Game. MIT Press. pp. 118–30. Tekinbaş, Katie Salen; Zimmerman, Eric (2006). The game design reader: a Rules of play anthology. MIT Press. This page was last edited on 12 February 2019, at 01:41 (UTC).